To perform a salt water flush, first thing in the morning, mix one quart of lukewarm water with two tablesspoons of sea salt. Drink the entire concoction before you have eaten any food. Within one hour you should have several bowel movements. If not, you may need to try adding a little more salt to the mix, or you may just need to drink more water to help aid the flushing process. Since this flush is not harmful to the body and your body cannot become dependant on the salt water, like it can become dependant on chemical laxatives, this flush is safe to use as often as needed. Drinking an herbal laxative tea in the evening before you plan to do a salt water flush. A laxative tea tea will help to loosen the deposits and gunk in the digestive tract making it easier for the salt water to flush the wastes out the next morning. Senna tea is commonly used. This flush can help clean the toxins and built up waste products out of your digestive tract. The juices used in juice fasting have a small amount of pulp the can build up in the intestine and ferment cause gas and bloating. The salt water flush can relieve the condition. During a water fast, the last meal and stay in the colon for many days and the salt water flush will expel this feces. It may take 3-5 salt water flushes to fully empty the intestine during fasting. Salt-water cleanses may be used to treat common colds, high blood pressure, digestive ailments, fever and degenerative related ailments. Most importantly it can kill harmful bacteria in the intestine. It’s important to have salt from a natural source that has not been processed. 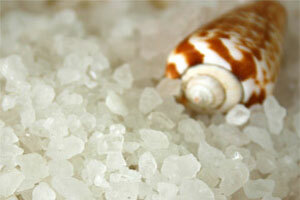 Sea salt is commonly used; evaporated salt, and ground-based salt is fine. Two heaped tablespoons are recommended. Lime of lemon can be added to reduce the bad taste. Always have a large glass of spring water with lime in it at hand. You can drink this in stages along with the salt water. You can take up to 20 minutes to drink the salt water, but it is normally recomended to be taken as quickly as possible. After 10-15 minutes massage your stomache 21 times clock-wise, then 21 times anti-clockwise, this will assist in the flushing process. The Salt Water Flush can take as little as 35 minutes to 2 hours to work. Most people experience minor discomfort doing the salt water flush. Persons with very advanced forms of ulcer, appendicitis, intestinal tuberculosis, or cancer are recommended not to practice this technique. Always take pro-biotic to replace your healthy intestinal bacteria that will have been reduced do to the antibacterial properties of salt. Do I Use the Enema in Conjunction With The Flush? That is a matter of choice. A daily enema would not be needed on the days where the Salt Water Flush is administered. Note From Keith: I have performed the salt water flush many times and is [HIGHLY RECOMMEND] as part of your fasting program. Take it easy on the first few days, especially if you have never done any kind of cleansing before (headaches commonly occur during detoxification.) Very soon you will be amazed at the effects on your energy, mood and emotions. Physical cleaning is often connected to a deeper more psychological and spiritual cleaning. Any additions for this Salt Water Flush post???? No …2 teaspoons won’t work for most people, far better to take 2 tablespoons of sea salt rather than going through the process all over again. As we all no the S.W.F can be rather unpleasant to endure. No …You can offset the taste of the salt water with a squeze of lime. Allways have a large glass of spring water with lime in it at hand. You can drink this in stages along with the salt water. No …You can take up to 20 minutes to drink the salt water, but it is normally recomended to be taken as quickly as possable. No … After 10-15 minutes massage your stomache 21 times clock-wise, then 21 times anti-clockwise,, this will assist in the flushing process. No …Timing of the S.W.F can take as little as 35 minutes to 2 hours to work. To add to this, most enemas only clean out the colone. The salt water flush will do a full cleanse, removing embeded waste that lies in the creases of the intestines, but this may take at least 3-5 salt water flushes to remove the foul waste that causes slower detox, as apposed to not performing the flush at all. I have read many articles mentioning that any enema” or flushing” should not, and does not have to be performed. My honest answer to this would be [rubbish] unless the above mentioned by Tom Coghill about reason why enemas and flushings sould not be performed. I have performed the salt water flush many times and is [HIGHLY RECOMENDED] by myself Keith Admin. When breaking a long water fast up to 40 days, [YOU MUST BREAK YOUR FAST BY LINING THE INTESTINES WITH HEALTHY BACTERIA]. The safest way to break a long water fast is by taking natural yoghurt containing live bacteria for 3 days prior to the digestion of any type of foods inc…fruits/veg. The reason for this]… It takes 3 days for the healthy bacteria to reform the lining in the intestines and gut. I thought it was not a good idea to ingest anything other than water during a water fast because it will awaken the digestive track and stop ketosis. Won’t the salt interfere with the thoroughness of the cleansing process and remain in your system? (This may be a stupid question, but I am really curious! 🙂 ) I used a enema for my last water fast and did not like the process or results very much. I felt like everything wasn’t being flushed out completely with the enema. It says 2 – 3 SWF to fully empty the intestine. How often do I need to SWF during fruit fast? Is it okay to do it in 3 consecutive days? What type of enema did you do? If you performed the enema with the kit, this will flush out the small intestines, but not giving the full cleanse! The main reason for the SWF is to cleanse the large intestines and colone by flushing out the waste that sits in the creases of the intestines slowing detox. My question to you would be..? Will your body remove the waste that lies in the intestines through natural elimination on a long water or juice fast? My answer to you would be no ! Here is my reason, even after 30 days on a water fast, and several SWF, and oral enemas called picolax, my body was still removing horrid foul smelling waste. There is no way through natural elimanation the body will remove this waste. In my experiance you need several SWF and several enemas to cleanse the digestive tract. Thanks for your question on this, We can look at your views in more depth, but the only way to prove this is by practicing what we preach, by experiance, trial and error. The SWF is not for the faint hearted. Thank you Keith for such a prompt response! yes…it was the enema with the kit. I did not do any oral flushes while on my last fast. I am interested in trying the SWF on my next fast. I just wanted to make sure that I will not be interfereing with the cleansing process by ingesting salt if on a strictly water fast. If you can allay my fears on this that would be great! In other words, will the salt awaken digestion and stay in my system? Only a small amount of salt is absorbed by the body on a SWF nothing to worry about, thats why they call it a flush, it is healthy to do the flush but there is to much focus on the salt. In my experiance of many flushes, the body will retain water if to much water is taken after the flush. [IN FEAR YOU THINK THAT THE SALT WATER WILL CAUSE DEHYDRATION SO YOU DRINK MORE WATER]. In my view, and experiance. water should be taken only when thirsty to avoid water retention. I am on a juice fast… if I do the SWF first thing in the morning, followed by drinking juice a little later, will my body retain those liquids too? I would rather take the route that doesn’t retain liquids if possible. I’m sure you guys are pretty busy but I would be **incredibly** thankful if you could reply to this post!! Since I’ve posted the above from June 2nd, I’ve done the SWF on June 9th. I had many successful BM for a couple days now and feel good about myself, BUT I believe I’m somehow retaining water. I only say this because the day after I weighed myself and i was the same weight as a few days before taking the SWF. I knew this couldn’t be given the consistency my body has been losing weight at, and I’m upset and a little discouraged that I am STILL the same weight today… 2 days later. I actually regret doing the SWF & wish I would’ve just used an enema. Please let me know your thoughts on this matter.. and how to resolve it. It’s only a little discouraging because I worked so hard to do this fast correctly and then this happened… Also today is also my 11th day juice fast, I am aiming for 30. Also, I forgot to mention that I work out almost everyday, but not to the point where I’m building muscle-weight. Salt increases water retention, yes. But the result is temporary and worth the benefit of killing any unwanted residents of the colon. I believe the value of the salt flush is during the start of the fast. Long-term the enema is more effective, easier and more comfortable. Try not to focus on the weight per day as it is like watching a pot boil. Try to get mild exercise daily like walking. I tried the SWF but after taking almost half of the mixture and after few minutes I throw up and all the Salt water mixture that I drank came out. Hi, I see that the last comment was from 2010 but I was hoping you’d get this and answer my question. I have done salt flushes in the past and love them. But I have only done epson salt flushes, so which would be best to do. I get great results from epson salt flush, also I am at the end of my 3rd day of my juice fast which was my initial goal, but after reading the different stages of juice fasting I think I am going to keep going as long as I can. This is my first fast and doing it to give my digestive track a rest and heal it as I have alot of digestive issues. I am always bloated and gasy so hoping this will help. Hi irena, First of all, a salt water flush isn’t a mandatory fasting process. It also depends on the diet that you’ve had over the last several years of your life whether or not you really need one. If you have been eating very badly for years, and are grossly overweight, I would recommend doing a series of things including a swf. If you are not very overweight and had some fiber and raw foods throughout your adult life, you can clean your intestines with; herbal teas, natural mineral fiber, juicing and enemas. I am going on a 30 day water and juice fast. Is it okay if I drink vitamin water on my fast? Hi Promise, Yes vitamin water is ok. Use it sparingly during a fast, according to your size and weight. Vitamin over-use during a fast can cause diarrhea, indigestion and nausea. That goes for capsules, tablets and powders too. When juice fasting, you get most of the vitamins needed and supplements are not necessary. Minerals like: omegas in flax seed, fish & olive oils, calcium, magnesium, potassium, [except maybe; sodium], zinc, and iodine are rarer in our diets but are just as important, and should be thought of more. Okay thank you so much Ron. I am on day 5 so far and have 25 more days to go. So far I am not even thinking of food but the first 2 days was the hardest. Do you think one or two bottle of vitamin water a day is okay or is it too much? I mostly am water fasting and that is why I drink the vitamin water. I will drink juices occasionally during the fast. I am 5’8 and 135lbs right now. I am doing a 30 day water/vitamin water fast. Hi Promise, I don’t see a problem. If you are having some negative reaction try stopping the vitamin water for a day or two. Listen to your body. When water fasting, you are ridding yourself of chemicals and impurities. It is best not to confuse your system with anything foreign. There is plenty of time to feed ourselves supplements while we are eating. Also this is very interesting. So I am on day 6 and I have only lost 4lbs. My metabolism is fast from what I thought because I could eat whatever and not really gain any weight. If my metabolism is fast, wouldn’t I have lost more than 4lbs in 6days? Our bodies are doing many processes while fasting. It will also hold water as part of the cell cleaning process. That’s how it feeds cells, and transports toxins and food in and out. Fluid makes up over 80% of our body! So, if you weigh 100 lbs, 80 lbs is water. I’ve gone for several days while fasting and lost only 2 pounds. And then lost 5 lbs., in a day. There is no accurate method to gauge weight loss during a fast. So, don’t try. If you want to lose a lot of weight while fasting, exercise using only aerobic equipment. But, you may also hurt yourself too. I can guarantee you won’t be fasting long while exercising daily. I’ve tried it! A suggestion: don’t weigh yourself everyday. Weight loss is counted in inches, not necessarily pounds! Look in the mirror. That tells the whole, true story. P.S. the first week or 2 is the hardest to gauge for weight loss. You will start to have a regular pattern after the second week. Approximately a pound a day. But that still doesn’t mean you will see it on the scale daily. It usually adds up to 7 pounds per week, depending on your size, activity, and type of fast you are doing. Wow Ron you are amazing! I am so happy I have you all here for support because I have researched fasting for years but it still seems like I am learning something new everyday. Thank you for your fast response and help. I agree with you! I will measure more in inches and not weigh myself daily. I am thinking I want to do 21 days on water. Will that be okay? I have fasted for 5 days before, then 6 days, and then 7 days has been my longest fast. I want to try for 21 days on water. If I do 21 days on water then eat for one week on fruits then go on another 21 day water fast, will this be a good idea??? LOL! Why thank you Promise. And I thought my wife was the only one who would call me amazing! I’ll try to live up to that. The fun thing about fasting is there are no rules! Just the ones we make for ourselves. What you have suggested is fine! It also makes it personal, and a nice goal. lol yes you have to live up to that! jk okay so please pray for me and I will try the 21 day water fast and go raw and then do another 21 day water fast. I am 5’8 and weight 135lbs. Do you think I will lose a lot of weight by doing this because I am hoping to lose at least 20lbs because I just feel better in my body when I weight a less and I eat healthier. I am hoping I can get down to 110lbs. Do you think it will be possible if I do 21 day water fast? Thanks again for answering all my questions. Okay Ron thank you! So I noticed when I am in the fasting mode it is better for me to keep going instead of starting and stopping because it gets hard to start again. So since I am 5’8 and weigh 135lbs if I just do 40 days on water/juice fasting instead of splitting up the days to 21 days, will my body go into “starvation mode” since I do not have a lot of extra fat on me? or from what you know will I be okay going 40 days? I know my body will tell me when it is going into “starvation,” but I just want to go the full 40 days. I just don’t want my body to start eating on its vital tissues? Hi, I had a couple questions… I’ve never done any type of fasting or flush, but I am 5” and weight like 100 pounds. I don’t want to lose weight but do you think it is safe to still do the salt water flush?